Now that Thanksgiving is over, it’s officially Christmas season (even though we’ve had our Christmas decorations up for over a week), and if you live in the Midwest like us, that means chilly weather and chili weather. If you live in the region of the Happiest Place on Earth, then you have no idea what I’m talking about, but for us, fall and winter are some of our favorite seasons, because you can cuddle and make comfort foods like chili. 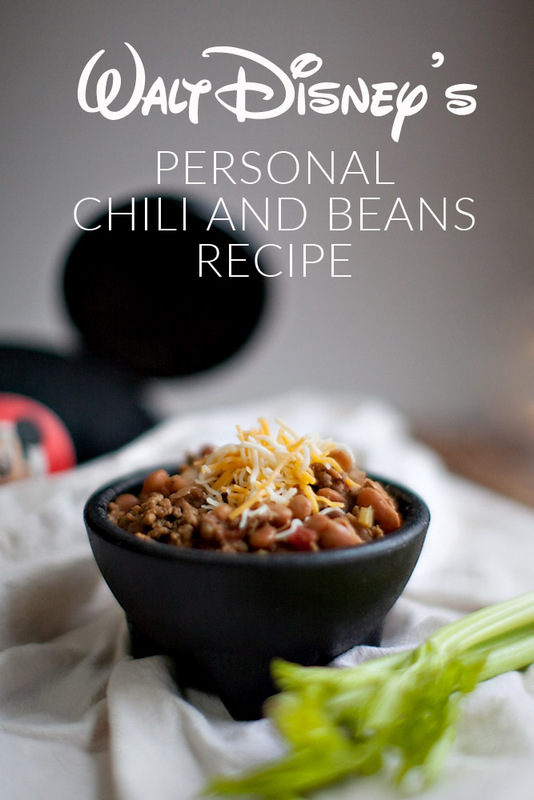 Even though, our Taste of Disney series is copycat recipes of foods you’ll find in the park, we couldn’t pass up the opportunity to make Walt Disney’s personal chili and beans recipe, and since his birthday is only a few days away, we’re making his chili in his honor. At first we hesitated to make the chili, because we’ve never made chili with pinto beans, we always use kidney beans, and I don’t know if you’re like us, but we like steam blowing out our ears, and if our nose ain’t runnin’, then it ain’t spicy enough, but apparently Walt didn’t have the same flare for flame when it came to his food, because this recipe is a very mild chili. I doubled all the spices, and added in the “more spicy” optional spices that we had, and it still had no heat in our opinion. Maybe that’ll really spice things up. With that being said, all four of our kids gobbled it up. Even my youngest, who’s probably the pickiest eater ever, chowed it down. So, for heat we have a zero, but for yumminess we have a 10! I’m so glad we made Walt’s chili, and we’re sure to make it again. Put Walt’s chili on to simmer, turn on your favorite classic Disney movie, and cuddle with your favorite people, then tag us on Instagram or Twitter using hashtag #yohotasteofdisney. Next morning, drain. In large soup pot, add beans and water to cover 2 inches over beans. It’s wintertime, so be sure to pin this recipe and give it a try on one of these grey winter days. Put Walt’s chili on to simmer, turn on your favorite classic Disney movie, and cuddle with your favorite people, then tag us on Instagram or Twitter using hashtag #yohotasteofdisney. Looks super yummy Charity! Looking forward to some new YouTube videos.